Thank you for joining me as we count down to the MFT release. We are four days away from the big day! All the new Stamps, Die-namics, and Stencils will be available on Tuesday, February 7 at 9:00 pm EST. Be sure to check out the MFT Blog to see all the new items being revealed today. Don't forget to leave a comment on the MFT Blog countdown posts, YOU could win one of the five $75.00 gift vouchers. We have a fabulous new floral set for you this month, the new Sketched Blooms 2 stamp set is simply gorgeous! 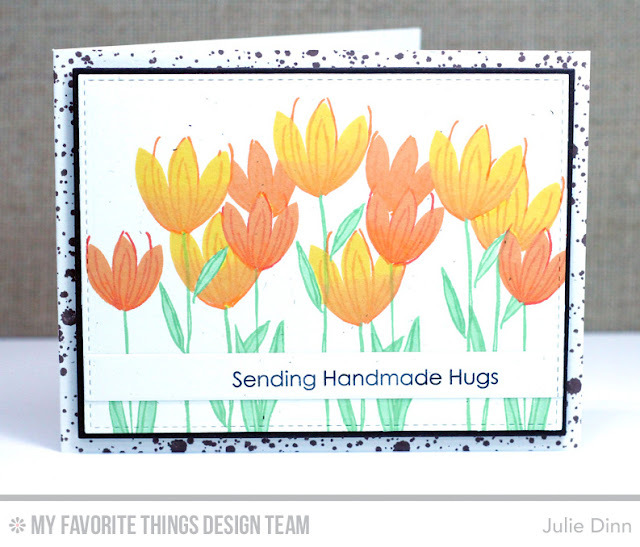 I used the tulip stamps in the set with a few of my favourite yellows and orange inks. This is absolutely spectacular Julie! So fun to see each designer's unique expression using the new products. This is so beautiful. I am going to have to try one like this. Julie--Pretty card! Love the colors. Beautiful card! I love both the Sketched Blooms sets. The loose, artsy style is really appealing. This sure puts a smile on a face. Your card just makes the heart happy. Awesome job. Lovely card, Julie. I love the black splattered background (via stamps) with the black and white layers of cardstock on top. The orange and yellow tulips make a great splash of color making a beautiful card. Thank you for sharing it. Love your sketched blooms card. This is really pretty.